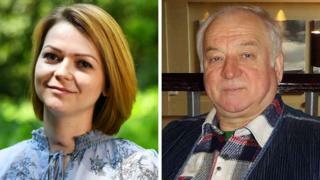 Sergei Skripal and his daughter Yulia were being monitored by the Russian authorities in the months before their poisoning, BBC Newsnight understands. The government alleged, in a letter to Nato, that the Russian authorities had hacked into Yulia's email account in 2013. I understand briefings given to UK ministers and allied governments suggested it went well beyond this. Sergei and his daughter were poisoned in Salisbury in March. With the police investigation not saying whether it has identified any suspects, four months after the Salisbury incident, the UK government's case against Russia is still based largely on secret intelligence. Both former spy Sergei, and his daughter, had been monitored for some time before March this year - something found out after the poisoning. Yulia's mobile phone has since been closely studied for signs of malware that could have allowed it to be used to track her whereabouts. Questions remain though about whether any of the surveillance of her and her father was detected before the attempt, and should have prompted an increased level of protection. What are Novichok agents and what do they do? The other main reason why the government blamed Russia rests with the identification of so-called Novichok nerve agent and its specific chemical properties. Experts from the OPCW international watchdog were invited to Salisbury to take samples in late March. They confirmed the UK's identification of the agent in the unclassified section of their report, which emphasised the high purity of the agent used to poison the Skripals. I understand that the classified section goes into further detail both about the purity and persistence of the poison. From this, it was deduced that the Novichok was produced by people employing a high level of skill in a very advanced laboratory. The inference was that the nerve agent could only have come from one or two labs in the world. Novichok agents were developed in the last days of the USSR, at the Shikhany facility in southern Russia. I met Sergei on a few occasions last summer and found him to be a private character who did not, even under the circumstances then prevailing, wish to draw attention to himself. He agreed to see me as a writer of history books rather than as a news journalist, since I was researching one on the post-Cold War espionage battle between Russia and the West. Information gained in these interviews was fed into my Newsnight coverage during the early days after the poisoning. I have not felt ready until now to acknowledge explicitly that we had met, but do now that the book is nearing completion. As a man, Sergei is proud of his achievements, both before and after joining his country's intelligence service. He has a deadpan wit and is remarkably stoical given the reverses he's suffered in his life; from his imprisonment following conviction in 2006 on charges of spying for Britain, to the loss of his wife Liudmila to cancer in 2012, and the untimely death of his son Alexander (or Sasha) last summer. His domestic routine appeared settled and quiet, with regular visits to the cemetery, favourite shops, and lately the Railway Social Club. Certainly he did not seem to feel himself under great threat. Sergei's Salisbury life might be best described as semi-retired, since he was making occasional trips to lecture or advise friendly intelligence services. But this appeared to be a standard arrangement with defectors, the former KGB man Oleg Gordievsky similarly giving talks to MI6 training courses and foreign agencies. One theory that investigators are probing is that Russia's spies might have regarded Skripal's activities of this kind as evidence he had re-entered the espionage world. Both he and his daughter must now make difficult decisions about their future. Yulia has spoken about her hopes of returning to Russia "one day". Her visit in March was only supposed to last a fortnight but now it is unclear what will become of her. Certainly, she is committed for the time being to helping in her father's recovery. For Sergei the equation is different. He was not expecting to go back to Russia, and now he knows he will not be returning to his home in this country either. His house in Salisbury has been bought by the government both as a crime scene and a place still in need of extensive decontamination. Will he make a new life under an assumed identity in the US or a Commonwealth country? That promises to be an extremely difficult decision. Certainly in US witness protection schemes, people are often asked to cut themselves adrift completely from their past. Having seen the peaceful life that he was enjoying in Salisbury last summer, I would imagine that will be very hard for Sergei. From the UK government point of view there is both an acknowledgement that Sergei and Yulia will be free to make their own choices and but also a hope that these will not trigger further political rows with Russia. The saga of Alexander Litvinenko, killed by polonium poisoning in 2006, shows though that those in government who want to move on from the Skripal affair may not have things all their own way. In the Litvinenko case, a police arrest warrant for the suspected poisoner, seven months after the deed, reignited the row. Should the police name suspects for Salisbury in the coming months, either in the poisoning or the surveillance of the Skripals that preceded it, then the issue will return to the world's front pages. Watch Newsnight weekdays 22:30 BBC Two and afterwards on iPlayer.